The first thing to do is make sure the audio interface you are using is completely up to date. Go to the website of the manufacturer and check for the most current software and drivers compatible with your system. Technology moves fast and if you’ve recently updated something like your computer’s operating system, there is a good chance you’ll need to update other components of your system too. With this in mind, you should also make sure any audio applications, software synths, and plugins you have are up to date as well. Always check the manufacturer’s website and update according to their instructions. After you have made sure everything is up to date, the next thing to check would be the hardware buffer size of your recording software. 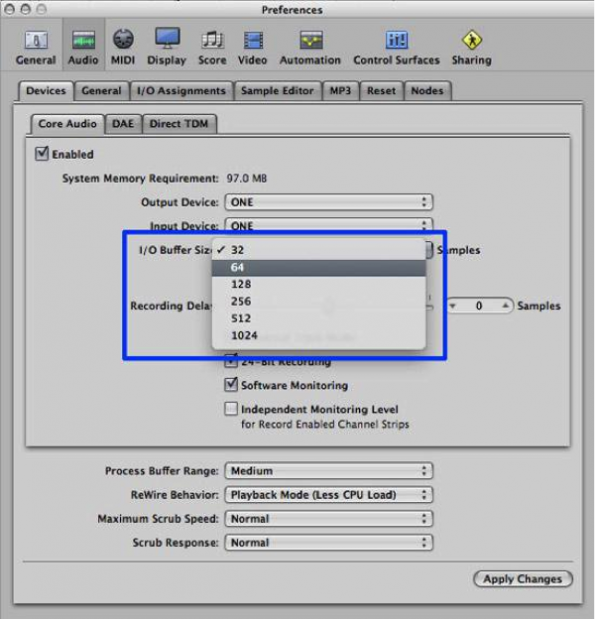 If you are getting clicks, pops, or distortion in your audio, increase the buffer size. 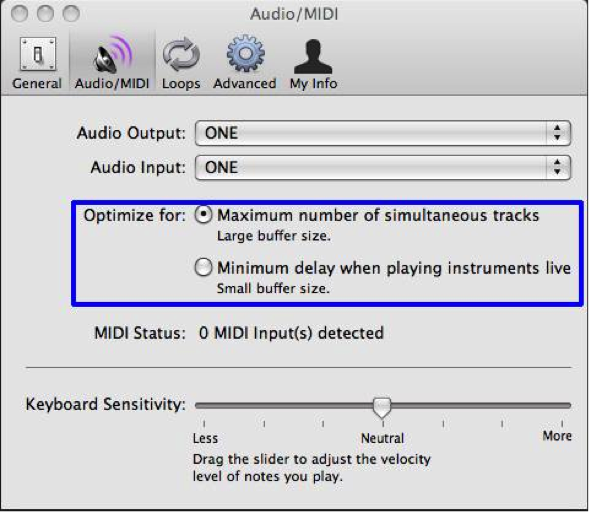 In Apple’s Logic Pro, for example, this can be done by going to Preferences > Audio. On the Core Audio tab you will see “I/O Buffer Size.” Regardless of what it is set to initially, move it to the next highest number. For example, if you are are set to 32 and getting clicks/pops, try 64. If it is set to 64, try 128, etc. Most other audio applications will have very similar settings. If you’re not sure where to find them contact the software manufacturer. Applications that are open while you are recording take up your computer’s valuable processing power. Audio recording, especially when you’re dealing with more than one track, requires a significant amount of processing power. When the amount needed exceeds what the computer can comfortably provide, the result can be clicks, pops or other unwanted digital artifacts. In order to dedicate as much power as possible to your recording software, quit any apps that do not need to be open while recording. Similar to applications, running plugins in a project also take up the computer’s processing power. Disabling plugins you are not using, or finding ways to reduce the number of plugins you are using while recording can go a long way to freeing up precious processing power. Conflicts can arise from other USB or Firewire devices connect to your system. This can include other audio interfaces, cameras, and even external hard drives. To check if one of these devices is causing your audio performance issues, try removing all of them and then reattach one at a time until your audio performance issue returns. Usually the last device you connected is the cause of your audio issue. You should then contact that item’s tech-support to report the problem and see if there’s a known solution. While these tips will resolve problems in most instances, there are rare occasions where one might have to resort to more drastic changes to eliminate clicks and pops. As recording programs get updated with new versions and features, they usually require a faster computer system. In some cases, you may want to consider upgrading the computer with more RAM, a faster hard drive, or even changing the system entirely to a new computer with a faster processor. Once you are able to find the right balance of settings for your system that successfully keeps your recordings free from pops and clicks, be cautious when modifying settings or updating as changes may upset the balance you’ve achieved. Preventing pops and clicks is a constant battle, but these tips should go a long way to helping you achieve the recording performance you desire. To learn more about recording, check out Apogee Electronics, award-winning manufacturer of audio interfaces for recording music on iPad, iPhone and Mac.